Last year, Debonaire Cigars launched their second cigar line, the Debonaire Maduro. This was a follow-up to the original Debonaire line. 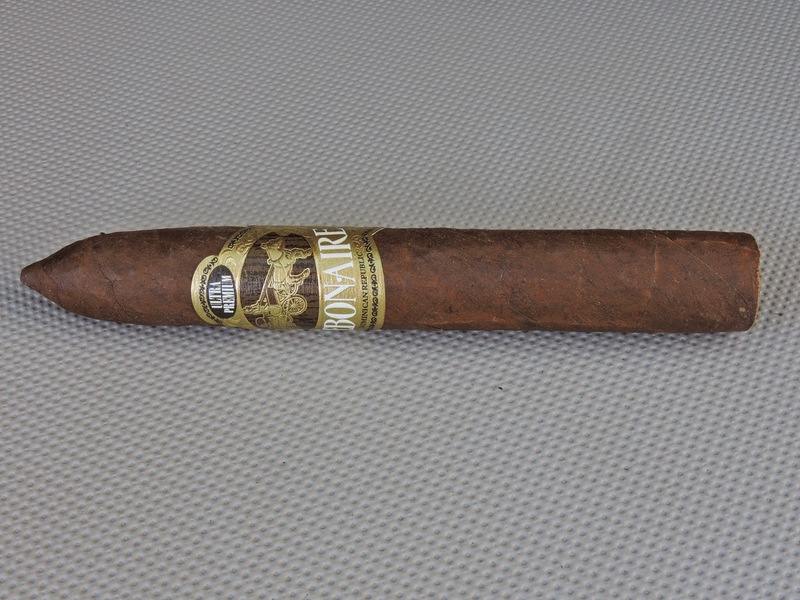 For the Debonaire Maduro, co-founder Phil Zanghi replaced the Nicaraguan Habano wrapper found on the original Debonaire line and replaced it with a Connecticut Broadleaf wrapper. In this author’s opinion, this resulted in the creation one of the great regular production maduro lines that has been released over the past few years. In fact, the Debonaire Maduro line finished #4 overall on the 2014 Cigar Coop Cigar of the Year list. 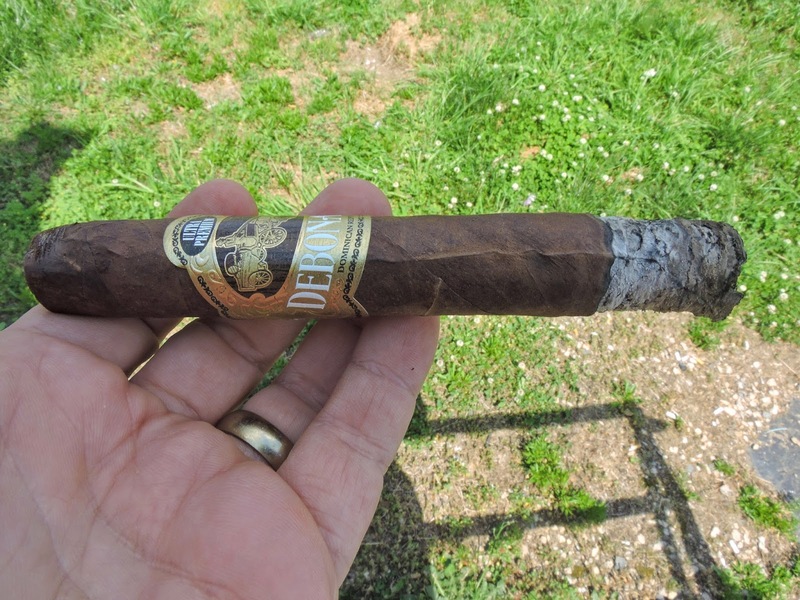 Several weeks ago, we took at look at the Debonaire Maduro Toro. Today, we take a look the Debonaire Maduro line in the Belicoso size. Overall, this is a vitola that represents everything that is special about this line. Debonaire Cigars was founded by Zanghi and Daniel Sinclair. Many people may remember Zanghi from his days with Indian Tabac – the company that eventually became Rocky Patel Premium Cigars. After a hiatus away from premium cigars, Zanghi returned to the handmade premium cigar business. The Debonaire in the habano blend made its debut at the 2012 IPCPR Trade Show. Without further ado, let’s take a look at the Debonaire Maduro Belicoso and see what this cigar brings to the table. In addition to the Connecticut Broadleaf maduro wrapper, the Debonaire Maduro uses a blend of tobaccos from Nicaragua and the Dominican Republic – similar to the Habano blend. Zanghi and his source tobacco Leo Reyes – one of the leading growers based in the Dominican Republic. The cigars are also made in the Dominican Republic. In terms of how the vitolas are constructed, the Debonaire line is bunched using accordion fold as opposed to entubado (tube) style. Zanghi emphasizes leaf placement in terms of being able to achieve the right flavor profile for each size. The regular production Debonaire Maduro uses the same frontmarks as from the original Debonaire line – except the limited edition Solomones is not available in the Debonaire Maduro. In addition, plans are for a 9 x 52 limited edition “A” size called the 33rd Degree to debut later this year. The Debonaire Maduro Belicos has a rich roasted coffee bean colored wrapper. Upon closer examination some darker marbling can be seen on the surface. There is a light coat of oil on the wrapper. The wrapper seams are well hidden, but there are some visible veins that give showcase the classic rugged look of Connecticut Broadleaf. The Belicoso tip tapered very similar to the way a (large) chocolate chip would. The band is the gold, brown, black, and white colored one seen on the original Debonaire line. There is a gold stagecoach that sits on a brown background. Above the stagecoach is a black oval with the text “ULTRA PREMIUM” in white font. Below the stagecoach is the text “DEBONAIRE” in large white font. In small black font below the Debonaire name is the text “DOMINICAN REPUBLIC” in small black font. The remainder of the band has black and gold adornments. Prior to lighting my Debonaire Maduro Belicoso, I placed a straight cut to remove around 1/2 of the tapered area of the tip. From that point, it was time to move on to the pre-light draw. The cold draw was simple, yet enjoyable. I detected notes of sweet cocoa and a slight tingly spice. With an excellent pre-light draw experience now completed, I was ready to light up my Debonaire Maduro Belicoso and see what the smoking experience would have in store. Out of the gate I detected notes of cocoa, cedar, white pepper, sweet maduro flavors, and the signature au jus note found that is prominent on many Debonaire vitolas. The sweet maduro notes had a raisin-like quality to it. The Debonaire Belicoso surprised me because the au jus note was present right out of the gate (which normally has not been the case). The cocoa notes became primary early on. The cedar, pepper, sweet maduro, and au jus notes became background notes. On the retro-hale I detected a combination of white pepper and cocoa. During the first third, the cocoa notes at times took on a coffee syrup taste that coated the palate very nicely. I also detected some earth notes in the forefront as well. By the halfway point, the earth notes became the primary flavor. The cocoa notes were now secondary. During this part of the smoking experience, I found the au jus notes to be more prominent than at other points of the smoking experience. The sweet maduro, cedar, and pepper notes were still present in the background. During the last third, the earth notes remained primary. The pepper and cedar notes were now slightly closer to the forefront. I found the au-jus, cocoa and maduro sweetness were now more distant. This is the way the flavor remained until the end. The end of the cigar had a little bit of harshness, but at this point it was time to put down the Debonaire Maduro Belicoso. The resulting nub was cool in temperature and soft to the touch. Overall I found the burn to perform very well on the Debonaire Maduro Belicoso. The burn path remained straight from start to finish. At times, there was some jaggedness on the burn line, but this was more cosmetic and only required some occasional touch-ups. The ash had a salt and pepper color and was on the looser side. The burn rate and burn temperature were ideal. The draw performed quite well on the Debonaire Belicoso Maduro. It was not a tight draw, nor was it loose draw. I found the Belicoso a very low maintenance cigar to derive flavors from. The tip of the belicoso where I made the cut did not get soft along the way. Back when I smoked the Debonaire Maduro Toro, I found this one of the stronger and fuller cigars that I had smoked in the Debonaire portfolio. Over time, I’ve found these cigars to slightly mellow in the humidor. At the same time, I have found the Debonaire Maduro to still keep its power and depth. Given the Belicoso had about 9 months in the humidor, I found this was the case. From a strength perspective, I found the Debonaire Maduro Belicoso to remain medium to full strength. Toward the last third, I did find it kicked up into the full strength range. Meanwhile, the body started out medium to full and by the second half, it had progressed to full-bodied. Overall I found the body had the edge over the strength by a small margin. One thing that I have really liked about the Debonaire Maduro is how it brings two great qualities together. It combines a lot of the traditional sweetness you get from Connecticut Broadleaf and integrates this with Debonaire’s signature au-jus flavored notes. Zanghi has mentioned several times on Stogie Geeks that as this cigar ages, the sugar content will emerge and deliver the sweetness on this cigar. Time in your humidor is going to be kind to this cigar, and it’s almost like putting money in the bank for a sure-fire investment. The Belicoso format was a size that really worked well on the Debonaire Habano, and it works just as well on the Maduro. While this is a cigar I’d recommend to a more experienced cigar enthusiast, I certainly wouldn’t discourage a novice from trying this. As for myself, this is easily a cigar I’d fight Chuck Norris for a box of. (*) Disclaimer: Debonaire Cigars is a sponsor of Cigar Coop / Stogie Geeks. Some cigars for this review were still purchased. For a list of retailers to purchase Debonaire, click here.